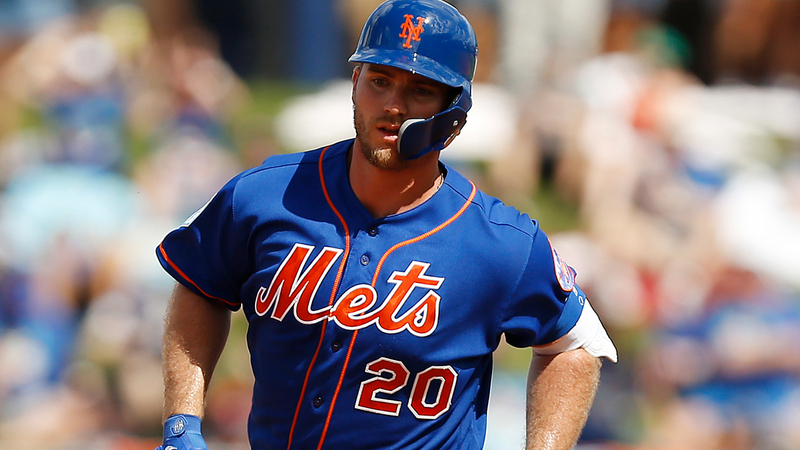 Pete Alonso may not be on the Mets' Opening Day roster yet, but he's doing everything he can to make his case for a slot. MLB.com's No. 51 overall prospect continued his torrid spring by tripling and scoring a run in the Mets' 8-4 Grapefruit League victory over the Nationals in Port St. Lucie, Florida. Alonso, who has three regular-season triples in the Minor Leagues, came up with the bases empty and two outs in the bottom of the first inning and punched a fly ball to deep-center field that turned into his first three-bagger of the spring. He scored one batter later on a single by Michael Conforto. It was the only hit of the day for Alonso, who's batting .368 with a 1.041 OPS and 10 extra-base knocks in 21 Grapefruit League games. The top Mets prospect is battling for the first-base job at Citi Field this season. Last year, he shared the Minor League lead with 36 homers and batted .285/.395/.579 with 119 RBIs in 132 games between Double-A Binghamton and Triple-A Las Vegas. Fellow first baseman Dominic Smith also has had a stellar spring with a .333/.382/.431 slash line in 18 games. Recent reports have suggested Mets are going to take Alonso with them when they break camp this week, although the team has made no announcement.